On my third trip to Leon, Haiti I truly began to understand the mystery that is Haitian culture. The trip began with a bang – we had barely settled into our living quarters when I was called to the clinic to deliver a baby. We were a mixed group – two Nurse Practitioners, a retired ER doctor, an Internal Medicine specialist, and me, the Family Practice/Sports Medicine doctor. No one was jumping at the chance to deliver a baby, including me. It has been at least 5 years since I have delivered a baby, and after volunteering to evaluate the patient I almost immediately regretted it. How would I perform? Would I remember the stages of labor? What would I do if there were complications? The clinic in Leon is rudimentary – there are none of the tools that would normally be available for a delivery here in the U.S. Most importantly, there was no OB/GYN ready to perform a C-section if necessary. I have a couple of good friends who practice OB/GYN and in the States I would normally call them. Unfortunately I had no cell service and even with the best of advice, I wasn’t going to transform into an expert with a simple phone call. Examining my 15 year old pregnant patient, on the first night in Leon. Nurse Carol is tending to the patient while I try to plan the next step. As I arrived at the clinic I saw a group of 10 Haitians waiting patiently. It was a bit chaotic, but we quickly evaluated the woman in distress. Carol, the nurse that accompanied me, was excited – she was hoping to transition her career to labor and delivery. Bob, the Lab Tech who was also our Team Leader, was on hand to keep us calm and make sure we were set up. He arranged for a local translator, affectionately known as Little Richard. With his assistance, I learned that our patient was 15, in her first pregnancy. She had started having contractions 1 hour prior. She was in pain and uncomfortable. I did a bedside ultrasound – the baby’s heart rate was normal and he was in the right position to deliver. I did an exam – the baby was still high up in her pelvis and wasn’t quite ready to come down. Bob did labs which were all normal. After thorough discussion with our team we determined that she wasn’t going to deliver the baby any time soon, so we sent her home to labor with a midwife. The excitement had drawn to a close, or so I thought. First thing Monday morning we were up and ready to get an early start for 8 am clinic. Our team was enthusiastic to get to work. When I walked into clinic I saw my pregnant 15 year old patient. I was once again confronted with my fears: what would I do if there was a complicated delivery? Would I be able to handle the situation? I re-examined her and she was still far from being ready to deliver. Both the nurse and the midwife said that they thought she needed to go to the hospital to deliver, and that likely she would need a C-section. I had no reason to doubt their evaluation, so we called the Haitian Health Foundation who sent an ambulance to transport her to the hospital. I regretted that I didn’t have the skills or resources to help her, but relieved she was in good hands. Once she was gone my translator “No-No” – short for Jeanot – and I got to work. Our team of five saw about 180 patients a day, and today was set to be a busy one. The clinic was full of people needing their chronic disease medication refills as well as those with more acute needs. Throughout the week we saw a melange of typical Haitian injuries: machete wounds, and skin infections gone awry. There were still people needing assessment for injuries sustained in Hurricane Matthew which struck in October 2016. Inside the remains of the Catholic Church that adjoins the rectory that we stay in. 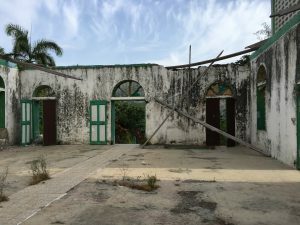 Hurricane Matthew took the roof, as well as the ornate detailing on the interior of the church. One thousand parishioners used to meet here each Sunday for mass, and they have been displaced to a temporary building for nearly 2 years. After each clinic day we had a team meeting to discuss our most interesting and difficult cases. One of the Nurse Practitioners was devastated that on the first day of her first trip to Haiti she had to tell a patient she had HIV. In total there were 3 patients newly diagnosed with HIV. Fortunately, HIV patients in Haiti have access to free care – which is rare in a place that lacks much government support. 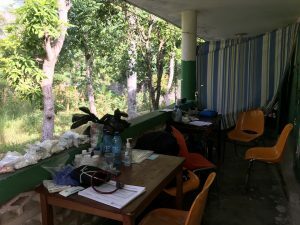 My clinic for the day – out on he porch stoop in the middle of the jungle. My most interesting patient came on the second to last day. By Thursday of each week we are in a flow – the nurses are efficiently triaging and taking care of patients. As providers we are in the groove – we have become familiar with the most common ailments, and what limited resources we have to provide. A woman came to triage with a large pregnant appearing belly and the nurse ordered pre-natal labs. We screen for anemia, urinary infections, HIV, and syphilis. The woman ended up seeing me and I quickly reviewed her chart. She had been seen in February by another Global Health Team group and had an ultrasound that showed she was pregnant. It was her first pregnancy, and she was excited. 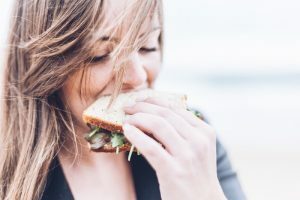 I asked her several questions – was she eating well? How did she feel? Was she having any bleeding? She said that she was bleeding every day of her pregnancy. This is not uncommon and can be a sign of the placenta being low in the womb. I quickly took her to do a bedside ultrasound, but couldn’t find a baby in her large belly. I had my colleague Dr. Mike come look at the ultrasound and both of us worried that we had broken the machine – all we could see was scattered grey and black images swirling around the screen. My first thought was how did I break this very expensive machine? I was so careful with it and was upset that I would leave a defective machine for the next team. Dr. Mike took a try at the ultrasound, and again we saw nothing. I told the patient it was broken and that we would just have to proceed without the ultrasound. Working with Dr. Mike on a foot injury and infection. The ultrasound was a blessing – without it we would have been lost! Surprisingly, my next patient was also pregnant. I thought perhaps I could do an ultrasound on her and see if the machine would work again. Of course the minute I placed the probe on her belly, I clearly saw a little baby, about 5 months in size. The hands, feet, and face were clearly defined, and the mother was overjoyed to see her baby. At that point I brought the other woman back to use the newly functional ultrasound machine. Except this time I put the probe on her belly and again saw no baby, but a mix of grey and black ill-defined images. At this point I was confused. Her belly looked and measured to be about 7 months along, and she had been diagnosed with a pregnancy 4 months before. I checked her chart and discovered there had been no urine pregnancy test, so I ordered one. It was negative. We found ourselves in an odd situation – a woman with a large pregnant appearing belly, a negative urine pregnancy test, and a peculiar ultrasound. Dr. Mike and I conferred and decided that she needed further imaging and consultation. The reality is that this level of care is non-existent in that region of Haiti. There is no MRI machine, and there was no one who would be able to figure out what exactly was going on in her belly. I was heartbroken to look into her eyes and tell her that not only was she not pregnant, but that she might have a difficult to diagnose condition. We had no resources readily available for her. To my surprise she took the news stoically. 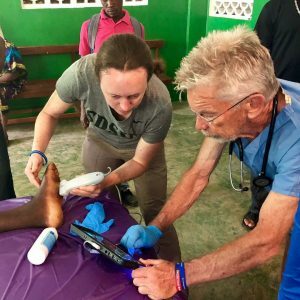 She said she understood what was going on, and agreed to come back the next week to see our Medical Director who would be able to connect her with any resources in Haiti that were available. Dr. Mike, the nurse, and I were all confused and sad about the situation. What must it be like to be a childless woman in rural Haiti, looking pregnant – but with no baby coming in several months – or ever. Women in Haiti are expected to produce children, many in fact, so they have family to support them in old age. A childless woman would have a tough life unless she had a very kind sister who would take her in (and could afford to). Although the not quite pregnant woman cast a pall over the mostly joyful experience in Haiti, I left with more hope than despair. On this trip to Haiti I saw indications of economic improvement. There were actual garbage trucks picking up the piles of trash in downtown Port-au-Prince. The government had graded the long dirt road to the airport in Jeremie, so that it was passable. Wealthy Haitians occupied our hotels and frolicked in the pool, spending money on alcohol and treats. Despite the grim overall economic picture in Haiti, perhaps there is hope for recovery and transformation. Maybe there will be a day when we travel to Leon only to give expert consultation, and when the local medical system will meet the everyday needs of Haitians. Hey, a girl can dream. 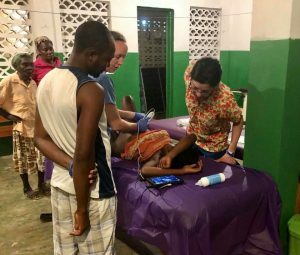 If you are interested in hearing more about how you can help in Haiti, please check out Global Health Team at globalhealthteam.org. You can also fill out the form below. In this video Dr. Myers gives advice to medical students, who are about to finish their residency, on criteria they should use to select and look for their first job in the medical profession. If you have any questions for Dr. Myers after watching this video please leave a comment below. In this video Dr. Alexandra Myers makes insightful comments on medical health care reform. Welcome to San Diego doctor, sports medicine, family practice website! Hello and Welcome to My new San Diego doctor, sports medicine, family practice website!